All that jazz: the KD Jazz Orchestra at the Canterbury Festival | Music Matters | Because it does. Doesn't it ? With the Canterbury Festival in full swing, the music department has a foothold in events both this week and next. This Friday, our very own conductor of the University Concert and Big Bands, the light-fingered Ian Swatman, is appearing at the Festival Club, St. Alphege Lane, at 8.30pm as part of the exuberant and lively KD Jazz and Dance Orchestra. 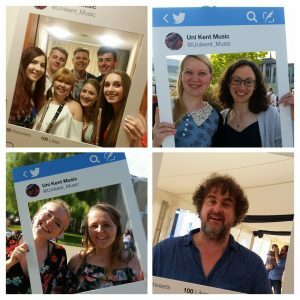 Alongside Ian are several of our visiting instrumental teachers: Peter Cook (sax), Steve Wassell (sousaphone) and Chris Hall (drums), whilst Kevin Dickon (trumpet) also guests with the University Big Band. Featuring a foot-tapping programme of music including Dixieland jazz and the music of Michael Buble, this’ll have you dancing in the aisles! (If they permit it, he added hastily…).